New book, 88 pages, SS10227. The B-29 was the most advanced production aircraft in the world when it took to the air for the first time in September 1942. While most often remembered as the type of aircraft that dropped the first atomic bomb, and for its extensive use in bombing Japan during the latter stages of WWII, the B-29 also saw plenty of combat during the Korean War. 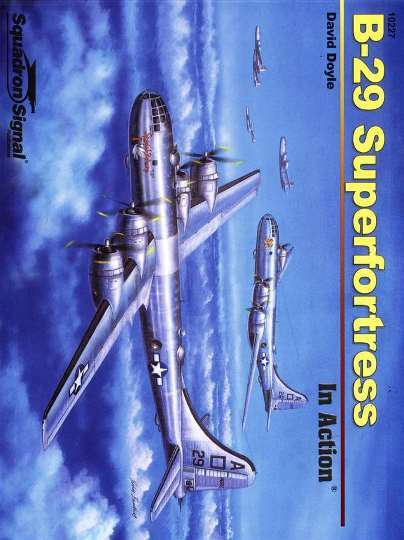 This all-new edition chronicles the history of this famed heavy bomber, charts the development, production, use, and disposition of not only the XB-29, YB-29, B-29, B-29A, B-29B, and of course the famed 'Silverplate' atomic bombers, but also notable variants such as the F-13, F-13A, SB-29, KB-29, EB-29, WB-29, P2B and the history-making X-1 carrier. Also includes coverage of the experimental XB-39 and XB-44 variants. Individual sections of the book explore the interior and armament of these bombers, as well as their production by Boeing, Martin, and Bell. Illustrated with 248 photographs, 90 of them in full color.